Beyonce’s first fragrance “Heat” is expected to be a huge success when it hits department stores next year. Industry sources are already projecting the fragrance to generate $100 million at retail globally in its first year. Knowles teamed up with Givaudane’s Claude Dir and Olivier Gillotin to create the superb scent. The name behind the fragrance comes from Beyonce’s past concert tours, where most of the performances had fire involved. 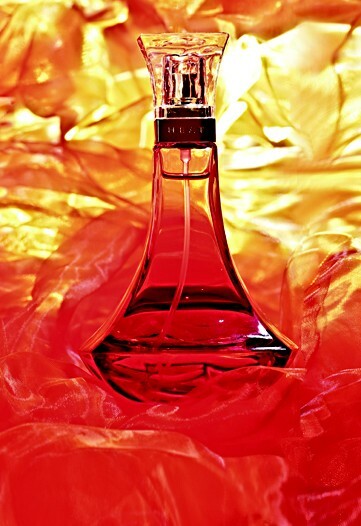 Beyonce also noted that red and gold are one of her favorite colors; which both colors frame the bottle. Heat has top notes of red vanilla orchid, magnolia, neroli and blush peach; a heart of honey suckle nectar, almond macaroon and creme de musk, and a drydown of giant sequoia milkwood, tonka bean and amber. I’m so happy with it, she said during an exclusive interview with WWD. I’ve been working on it for a while now. I was on tour for a year, and I have meet-and-greets with fans. I’ve never in my life gotten so many compliments. Coty has their own testing, but that was my testing! The fans loved it. They were like, I love that, I’m getting that, why isn’t it out right now? I need it! said Knowles with a laugh. Heat will come in three sizes; 1 oz. for $39; 1.7 oz. for $49, and 3.4 oz. for $59, as well as a 6.8-oz. Gold Sparkling Body Lotion for $24. The fragrance is set to hit stores in February 2010.